The Miss International 2016 pageant crowned its new winner at the Tokyo Dome City Hall in Japan on Thursday, October 27, 2016. 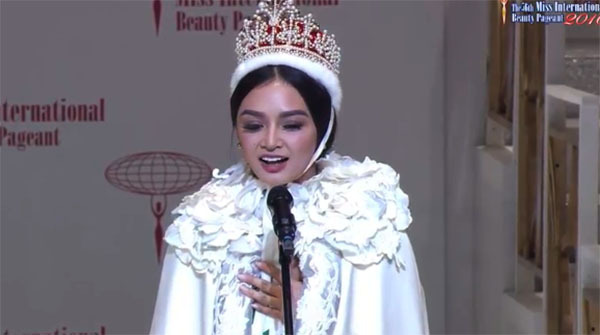 Kylie Verzosa from the Philippines was named as the Miss International 2016 after beating 68 other lovely ladies from around the world. Other winners are 4th Runner-up USA, 3rd Runner-up Nicaragua, 2nd Runner-up Indonesia and 1st Runner-up Australia. Did you missed the Miss International 2016 grand final competition and grand coronation night? Watch the highlights and replay video below. What can you say about the pageant result? Share your comments and views on the discussion box below.